It is time to explore how temperature will affect the height of a soda geyser. Remember that temperature is simply a way to measure heat energy, or how fast the molecules that make up a substance are moving. So, because the molecules are moving faster in a warm soda than a cold one, we would expect nucleation to happen faster in a warmer soda. But, to be sure, we’ll have to test it! Note that we aren’t going to measure actual temperature, but relative temperature. In other words, rather than trying to maintain a precise temperature for each soda, we’re going to have one set that is cold (I stored them for several hours in an ice bath), one at room temperature, and one that was hot (we put them out in the sunlight on a Houston summer day in August when we filmed this episode). We only change one variable (one thing that could affect the experiment) and try to control, or keep constant, the other variables as much as possible. The variable you change is called the “experimental variable” (the relative temperature) and the ones you try to keep constant are “controlled variables” (number of Mentos and brand of soda). There may be some factors that can’t be controlled without taking more extreme measures (ex. wind – for some reason they still wouldn’t let me set them off inside the Children’s Museum of Houston! ), but do the best you can. Finally, repeat your tests several times and take the average of your data (we did three for each relative temperature – ice cold, room temperature, and summer heat). 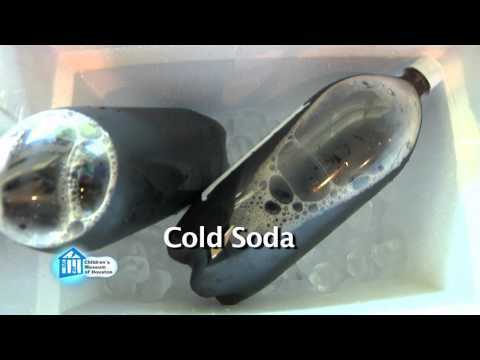 Set up the soda geyser generator per instructions, but vary how they are stored – put some in a refrigerator or ice water, keep some at room temperature, and store some out in the heat of the day. Measure the maximum height of the geyser and record. We used some homemade altitude trackers like the ones here. Repeat steps 5-7 several times for each number of Mentos (we did three tests per each). MAKE SURE TO THOROUGHLY DRY OUT YOUR GEYSER GENERATOR BETWEEN LAUNCHES. Repeat steps 4-8 to test all the different numbers of Mentos. Compare the averages – which did best? What, you thought I’d actually just tell you how many we found worked best? Wrong! Go have some messy fun and find out for yourself.